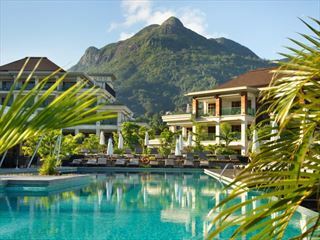 The sprawling Constance Ephélia offers a brilliant, tropical hideaway for families and couples – its 120 hectares of land is home to a multitude of gorgeous suites and villas, a tranquil spa, a plethora of adrenaline-inducing activities, and four lovely swimming pools. Set in the verdant, exotic flora of northwest Mahé, Constance Ephélia has a breath-taking backdrop of rainforest-clad mountains. The resort is bordered by two stunning beaches, whilst a luscious mangrove forest separates the north of the resort from the south. One of our favourite excursions at the resort is a kayak expedition from the south beach to the mangrove forest – a scenic journey that provides a unique way to while away the afternoon. 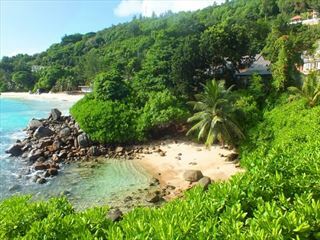 Split into two parts, Constance Ephélia is one of the largest resorts in the Seychelles, though it doesn’t feel like it. Instead it feels intimate and secluded, and provides the perfect playground for families. Kids will certainly love this resort, with its cool kid’s club, excellent pools, and even ziplining and rock climbing activities – as well as a pen full of giant tortoises waiting to be fed at 4pm each day. 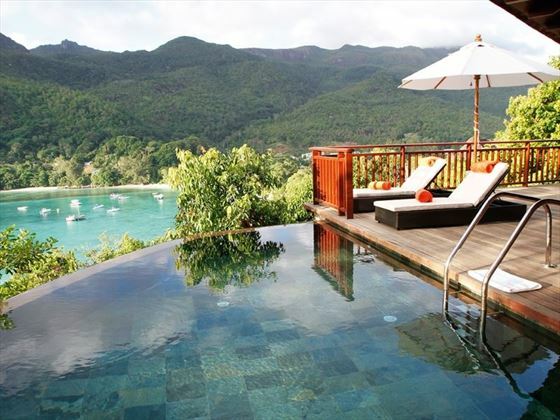 This is definitely one of the most family friendly resorts in the Seychelles thanks to its plethora of activities. 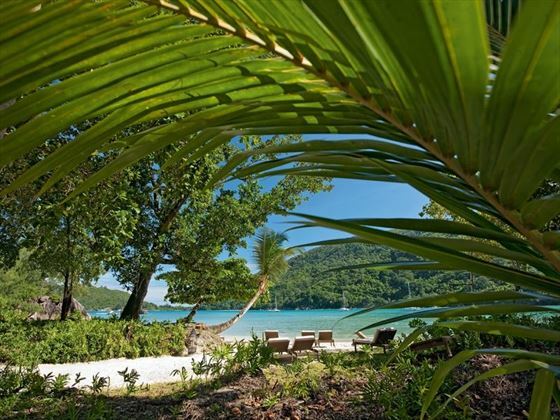 The north of the resort is home to the Senior Suites and villas, as well as two a la carte restaurants, the beautiful Port Launay National Marine Park, ziplining and rock climbing. Meanwhile, the south is home to more facilities – including the soothing spa, the kid’s club, tennis courts, three restaurants and a bar – alongside the Junior Suites and Tropical Garden View Rooms, and the jaw-dropping Ans L’Islette beach. Guests have access to the whole resort, either walking through the palm-tree clad pathways, or taking in the views on a buggy. 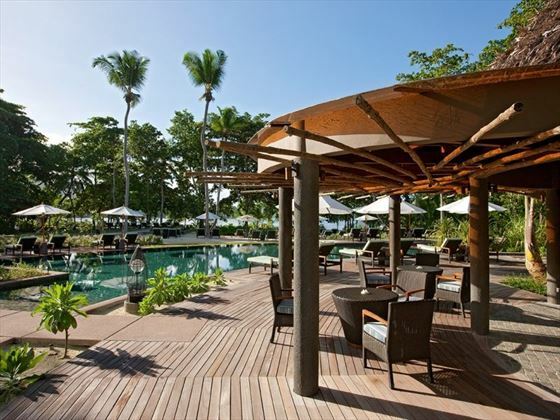 Located in northwest Mahé, this brilliant resort is nestled is the island’s tropical flora, overlooking the beautiful National Marine Park of Port Launay. 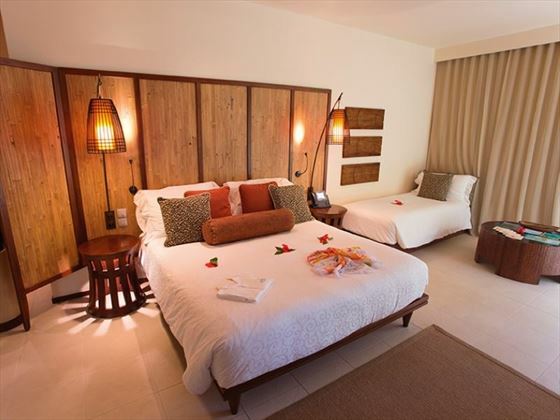 Tropical Garden View Room - Gorgeous rooms ideal for couples or single travellers, with beautiful decor, a private balcony and access to the gardens. Sleeps a maximum of two adults. 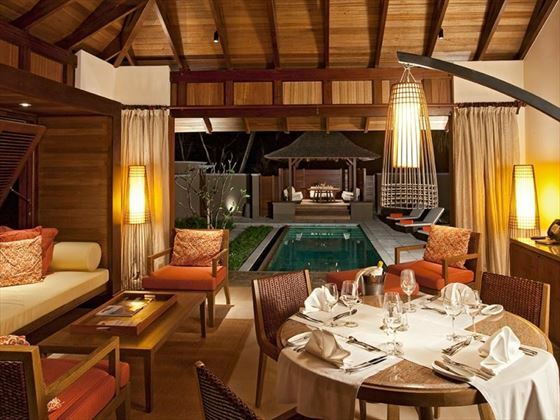 Junior Suites – Only a few steps from the beach, these sophisticated suites all feature a large furnished terrace, a spacious bathroom, a comfy seating area, and charming Balinese style décor. There are four clusters of six Junior Suites, and each cluster has its own plunge pool. Sleeps a maximum of two adults and one child. Senior Suites – Located near the picturesque lagoon, these are larger than the Junior Suites, again offering a scenic terrace, large bathroom, and comfortable beach-style interiors. There are four buildings featuring 10 Senior Suites each, close to the pool near Corossol. Sleeps a maximum of two adults and one child. 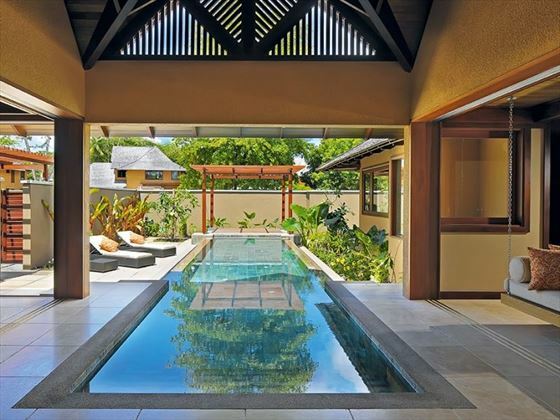 Spa Villas – These villas are beautiful and decadent – as soon as you open the gate you’ll be graced with a long infinity pool, and a gorgeous master bedroom with glass doors overlooking the garden. The villa even has its own swinging chair, a sauna, a steam room, and a treatment room so you can indulge in in-villa spa therapies. This treatment room can also be turned into a second bedroom should a family want to stay here, though this villa is more recommended for couples. Sleeps a maximum of two adults and two children. Family Villas – This villa category wowed our sales team, mostly due to the open-air living room that overlooks the large garden. In the garden is a small plunge pool, as well as a cabana with comfy sun loungers. Inside, there is an en-suite master bedroom downstairs, whilst upstairs there are two bedrooms with a shared bathroom. 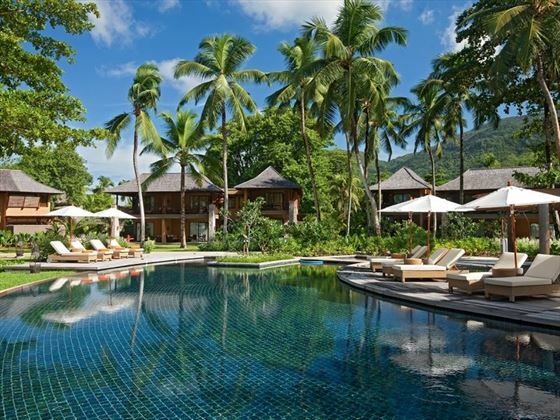 One of the villas has a two heart palm tree residing in its garden – which is very rare. Sleeps a maximum of six adults and one child. Beach Villas – These pretty villas are close by to the north beach, featuring a lovely private pool, stylish décor, and either one bedroom or two bedrooms. Those with one bedroom sleep a maximum of two adults and two children, whilst the two bedroom villa sleeps a maximum of four adults and two children. Hillside Villas – Available to adults only, these beautiful villas are nestled up in the luscious hillside between tropical trees and granite rocks, overlooking the marine park. The décor just oozes intimacy and romance, with an infinity pool and pretty décor. A one bedroom Hillside Villa sleeps up to two adults, whilst the two bedroom villas sleep up to four. 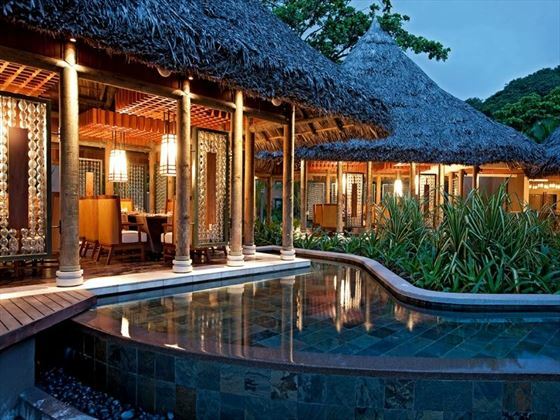 Presidential Villa – There’s only one Presidential Villa, and it’s truly stunning. With enviable views of the ocean, a private gym and spa, a pool, and an outdoor dining kiosk, you’ll have everything you need for a secluded holiday with friends and family. Sleeps a maximum of six people, in any which way you like – ranging from two adults and four children, to four adults and two children. Corossol – The resort’s main buffet restaurant, this picturesque eatery has an al fresco seating area located on an over-water terrace. The buffet itself showcases cuisine from all around the world, with live cooking stations and a very wide variety each day. Helios – This casual chic restaurant and al fresco bar is nestled on the south beach, offering a delightful Mediterranean buffet, as well as tapas, mezze, pizza, and more. You can even treat yourself to a waffle or pancake with ice cream from 3pm till 5pm. Adam & Eve – Using its natural surroundings, this sand floored restaurant has a gorgeous beachy feel thanks to its minimalist décor. Located near the Junior Suites, this restaurant has a flavoursome Asian inspired menu, with open-air seating and a bar that offers fresh fruit and vegetable juices. 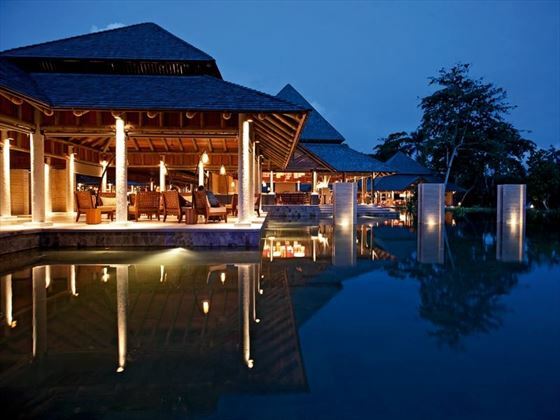 Cyann – This is the attractive fine-dining restaurant, with al fresco seating surrounding a gorgeous serene pool. The ambience here is soothing and extravagant, offering sumptuous signature dishes and a sophisticated bar with a fabulous selection of aged rums. Seselwa – Enjoy beachfront dining at this pretty a la carte restaurant. Bright cushions add a pop of colour to the minimalist décor to create a fresh and airy ambience, and the bar adds to the mood with its chilled Creole tunes. 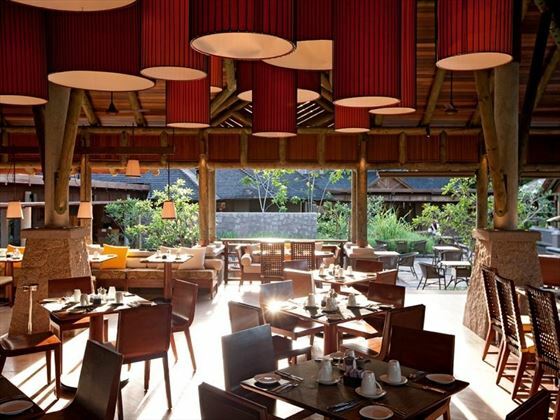 Breakfast is only available to those staying in a Senior Suite or one of the villas. Zee Bar – Open all day until late in the evening, this is a cool, sleek bar located in the middle of the lobby, consisting of an oval shaped bar surrounding an island full of fantastic spirits and wines. There’s also a spacious lounge for you to sit back and enjoy a drink whilst the live DJ plays a few tunes. A snack menu is available from 12pm to 10.30pm. Kabana – A little beach hut nestled on the north beach, offering light snacks and ice cold drinks. Breakfast & Lunch: Elegant casual - no bikinis or sleeveless shirts, and guests must wear appropriate footwear. Dinner: Elegant chic - no sleeveless shirts or ¾ length trousers. Men are required to wear trousers, and all guests must wear appropriate footwear. 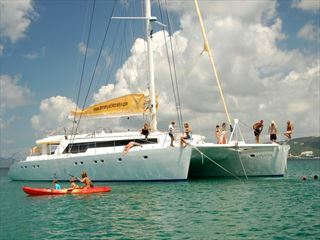 The resort has two beautiful beaches to lounge on – one in the north, and one in the south. 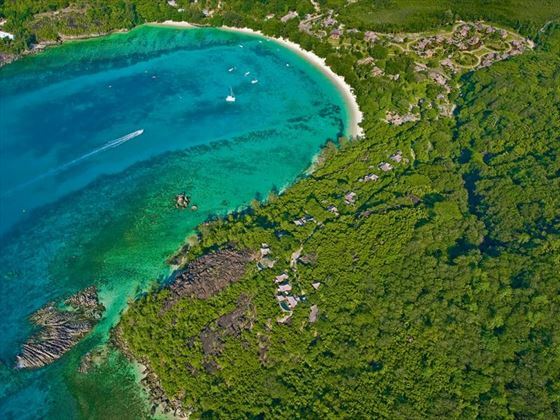 The south, Anse L’Islette, has powdery white sands, shallow waters, and beautiful views of the natural surroundings, whilst the north is smaller yet just as stunning, with views of the hillside villas, unspoiled landscapes, and locals attempting to sell coconuts. Beach Villas and Family Villas have their own private pools, whilst each cluster of Junior Suites has its own pool. There are also four resort swimming pools open to all guests. U Spa by Constance: Nestled in the south area of the resort, this calm, peaceful spa offers a place of solitude and rejuvenation. There are 18 treatment rooms in total - ranging from single and double rooms, to a salon and a nail bar - which consist of little thatched-roof huts that create a feel of seclusion. 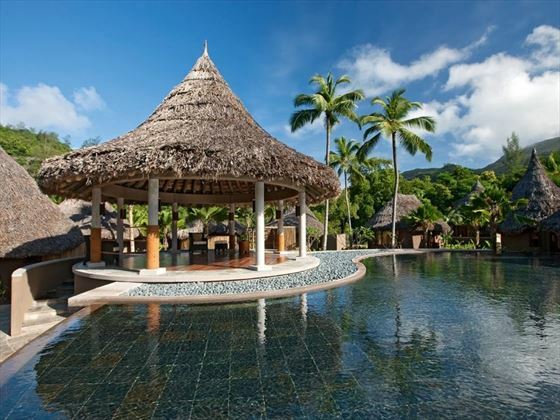 There’s also an elevated pool with a pavilion for relaxing or doing yoga, with the most magnificent backdrop of jungle clad mountains, and plenty of places to sit back and relax with a drink. This tranquil spa aims to restore your wellbeing and revitalise the senses, using U Spa products creating with local ingredients and naturally blended. The spa area and pool is open for all guests between 10am and 2pm, whilst the spa is only open for paying guests who have made a booking between 2pm to 9pm. The kids will love the pen with giant tortoises – you can even feed them daily at 4pm. Ziplining and rock climbing excursions will be sure to keep them entertained. Constance Kids Club – children from the age of four to 11 will love this fun kid’s club with its wide variety of activities – including pizza making, crab hunting, and swimming in the club’s kid’s pool. Open 9am to 8pm, and free – though you’ll have to pay an additional cost for lunch. Tropical, Garden view rooms and Junior and Senior Suites - spouse receives between 30% & 60% discount on Half Board Basis. Villas - spouse receives between15% and 30% discount on Half Board Basis. BB clients have a set menu and HB clients have an upgraded menu at Cyann restaurant once excl. drinks. A wedding certificate not older than 12 months must be provided at time of booking and must be shown at check-in.